It’s Easter! And to celebrate, the perfect confection would be the Cotton Candy Martini! Known as the Pink Punk Cosmo and developed by the people at T. G. I. Friday’s, this very sweet, sugary concoction might satisfy your craving for jelly beans. I’d say the drink started appearing on Friday’s menu about four or five years ago? I first encountered it at a Friday’s in New York City near Times Square. Technically, the drink is a variation of the Cosmopolitan, switching out the Triple Sec with Pineapple Juice and adding cotton candy. I’m not 100% certain of their exact recipe, but knowing the basic ingredients, I’ll offer this version which comes close to the real thing. 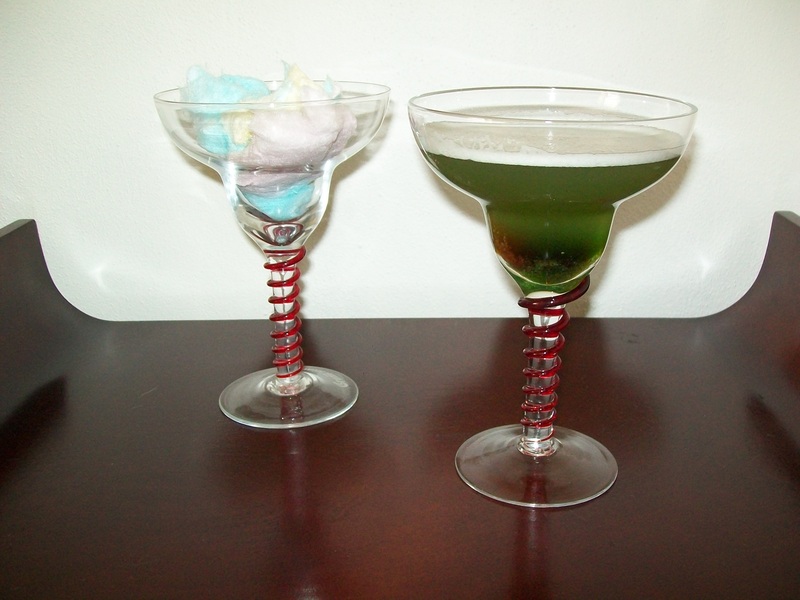 Put a handful of cotton candy in a martini glass of choice. Pour 2 ounces of vodka, 1 ounce each of cranberry and pineapple juice, and a splash of lime juice in a shaker over cracked ice. Shake and then strain into your glass over the cotton candy, which will dissolve into the drink. It doesn’t hurt to give the drink a quick stir. How I like it: I used a shade more pineapple juice than above, and for the cranberry, I used a splash of regular cranberry juice and substituted a white cranberry-strawberry juice. It seemed to suit the drink’s theme a little better. Now, as for why the drink is green instead of pink. Well, let’s just say that—as you may notice in the above photo—blue, yellow, and pink cotton candy apparently dissolves into a lovely green color. You might want to make sure you just use pink colored cotton candy for the best effect. Obviously Friday’s knows best, but this approximation will suit just find. Give a try and see what you think. And you can always try the original at your local T. G. I. Friday’s. Don’t get a sugar rush, drink responsibly!